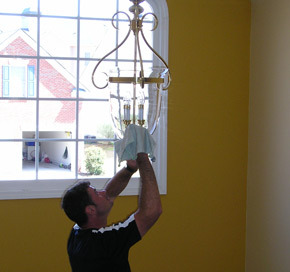 Chandeliers, light fixtures, and ceiling fans are hard to reach and collect a lot of dust. We hand clean light fixtures with the same non-toxic, biodegradable solution that we use on the windows while protecting the floors underneath. We also install or replace any lights that you provide. This is most affordable service that we offer with the biggest “wow” factor. You will not believe the difference. Pricing is based on the type of fixture or fan. As with any other service that we offer, we stand by our work and have a 100% satisfaction guarantee. To receive a free, no-obligation estimate please contact us today.